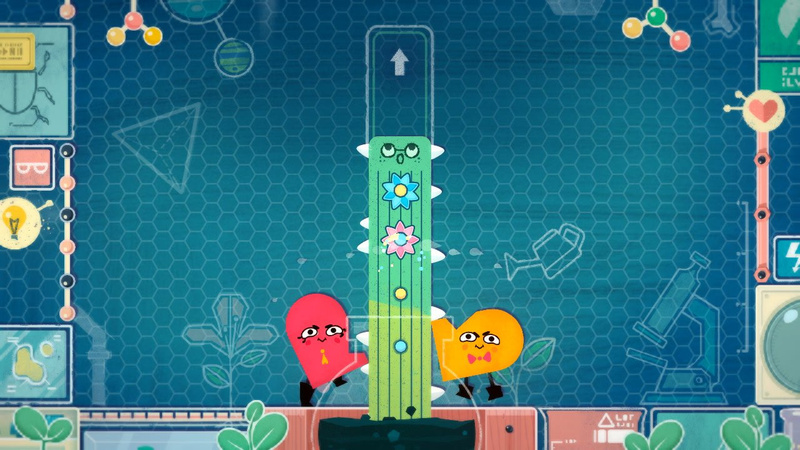 "We knew the game's strength was local co-operative multiplayer"
Since we grabbed some time with it at the end of a January Nintendo Switch preview event, we've been looking forward to Snipperclips – Cut it out, together!. Conceptually it is a game that can work on any system with at least two pads, but the 'play anywhere' multiplayer of the Switch makes it the perfect home for this co-op experience. On top of that its colourful and zany art style, combined with its unique 'snip' mechanic and smart puzzles, promise much ahead of the system's launch day. Upon loading up that initial demo it was marked as copyright Nintendo, published by Nintendo; that seemed feasible, too, as it's a very Nintendo experience. The reality, though, is that it's a smart title developed primarily by two brothers in the UK - Tom and Adam Vian through their studio SFB Games. Originally called 'FriendShapes' in early 2015 demos, it's undergone a notable journey to being a first-party launch title. Eager to learn more about how this came to pass and what the final game will offer, we had the opportunity to pose some questions to the Vian brothers, exploring the path from fun Indie demo to full Nintendo release. Can you introduce yourselves and tell us a little about SFB Games? Tom: Hi! I'm Tom Vian, the technical director of Snipperclips. Adam: Hello! I'm Adam Vian, the creative director of Snipperclips. SFB Games is a company formed by my brother Tom and myself. We've been making games together for a long time, but we officially became SFB Games in 2012. The company is quite small, sometimes just the two of us, sometimes three, but for Snipperclips, we had six people working directly at SFB Games – our biggest team yet! Tom: The rest of the team based in our office are Danny Gallagher, Catherine Unger, Daniel Fineberg and Terry Magnus Drever. We also hired Calum Bowen to write the soundtrack, and Kimlinh Tran to be the voice of Snip and Clip. We couldn't have asked for a better group of people to work with, they all brought incredible talent and dedication to the project. 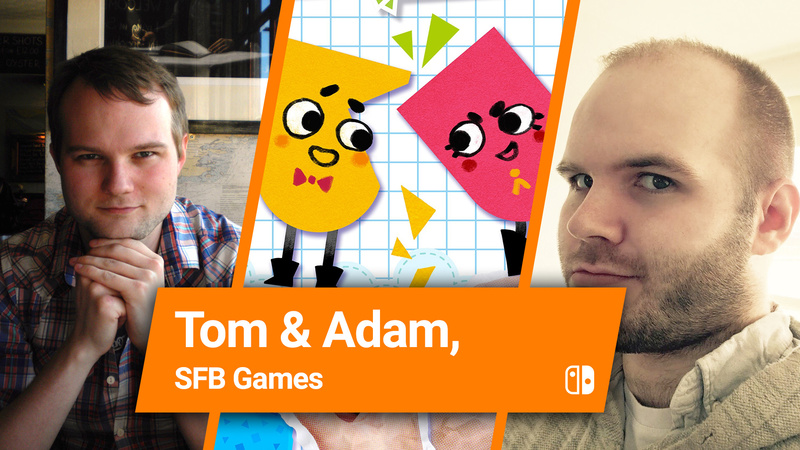 Adam: Previously Tom and I have made games for web browsers, mobile devices, and PC, so we're excited to finally make a game for a home console! Tom: And a portable console! In its earliest days you presented Snipperclips as 'FriendShapes' (in Autumn / Fall 2015). Can you talk about how the original 'snipping' concept and early demo came together? Adam: When the idea popped into my head, it was actually in the form of a fighting game, not a puzzle game. I was imagining a character reaching out and chopping shapes out of their opponent, to make them fall over. When I started drawing it, I realised the snipping concept would be more interesting if the two characters were working together. I quickly decided on the shape of the character which would be the most useful – one rounded side and one flat side. Tom: We prototyped the idea in a single day. Even from that first day, it was already a lot of fun; Adam and I would burst out laughing as we tried out shapes and ideas. We could tell that it was going to be worth our time to develop the game in some form, so we spent another week on it to develop the original "Friendshapes" prototype demo. 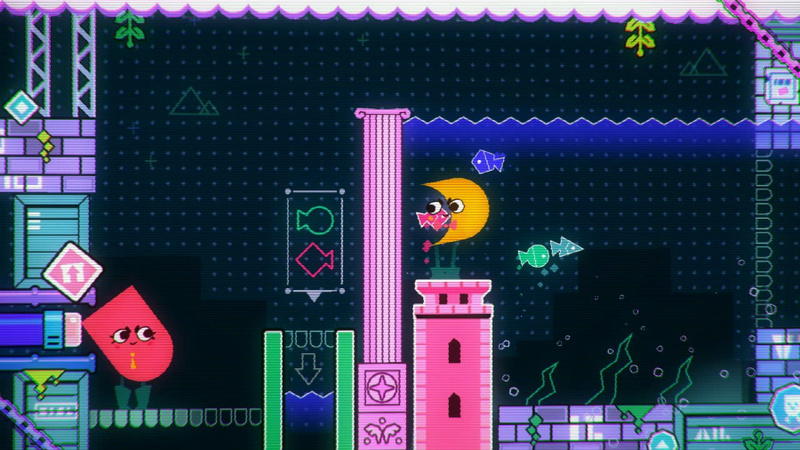 Some of those first puzzles have made it all the way into the finished Snipperclips game! What sort of feedback did you get on that original build, and how did that inform ongoing development? Tom: Seeing people have a really great time with the few rough puzzles we'd made really helped confirm our suspicion that we'd hit on something potentially special, and worth pushing further. That original build also won us a spot at the GDC EU Innovative Games Showcase, and got a spot in the EGX Leftfield Collection. Both were amazing for seeing lots of people play the game together, sometimes as friends, sometimes as strangers, but everyone seemed to enjoy themselves either way! Adam: We quickly realised that although the game was fun, your experience depended entirely on the teamwork between the two people playing. If one person was being stubborn and ignoring the other, for instance, the team wouldn't make progress. Rather than consider this a problem, we liked how the game highlighted the relationship between the two players. That's kind of a unique aspect of Snipperclips. When did you first talk to Nintendo about the game, and what were your thoughts when that happened? Adam: We had a contact at Nintendo from a previous encounter, so when it came time for us to show the "Friendshapes" demo to potential publishers, Nintendo were at the top of our list. Honestly, we weren't confident it would lead to anything, but we felt like the game had a certain Nintendo quality of playful, local co-op gameplay - so we thought it was worth a try. Tom: When we first heard back from Nintendo, saying that they loved the game and were interested in collaborating with us, we were incredibly excited! We grew up together loving Nintendo games, so it was very special to suddenly be working with them. 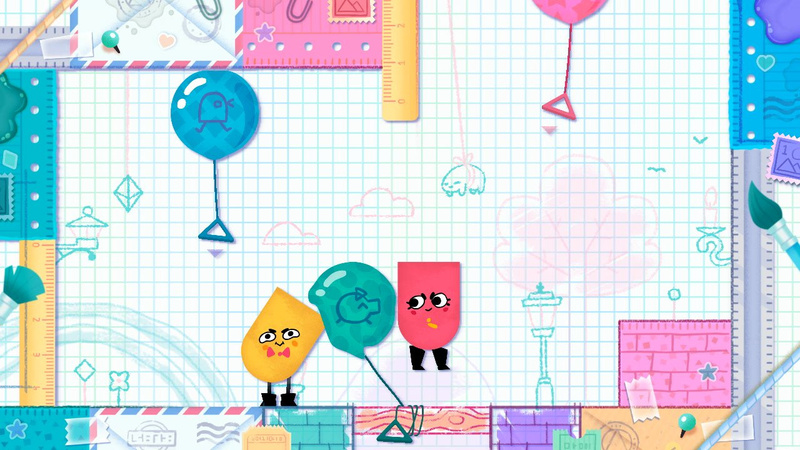 At what point did you begin work on bringing Snipperclips to the Nintendo Switch, and how significant a moment was that for you as a team? Tom: We started working with Nintendo at the beginning of 2016. Back then, it was still just Adam and me in the office, but we very quickly hired a second programmer, and then soon after a second artist. Our colleagues at Nintendo would joke that they'd never had a company have to double in size for them before! Eventually, we added another two members of the team, to make sure we could really make the game shine in that Nintendo way. Adam: For a while we developed the game without a specific Nintendo console in mind. But we secretly hoped that if the project went well, there might be a chance that we would be able to make it for the Nintendo Switch. When that was finally decided, it was a big moment. It felt like Nintendo were really trusting us – the Switch was a big secret all throughout 2016! We're really grateful that Nintendo took a risk in trusting this small, unknown indie company. Can you clarify the process for development, such as the collaborative process between you and Nintendo? Adam: Nintendo were very supportive! There was a clear message that they didn't want to re-invent the game, they just wanted to help us improve it. There was a lot to decide on between the two companies, such as how big the game should be, what modes to include, how many players to support, and so on. Overall our vision for the game lined up with theirs really well! It was great to be working with a company with the same priorities as SFB Games – fun, accessible gameplay experiences. Tom: Nintendo was even able to provide direct help with creating some of the game, such as the sound effects, some of the level design concepts and some level concept art. It was a surreal privilege to work with these super talented people who are responsible for some of our favourite games. Snipperclips has been presented (so far) primarily as a co-op title; in your view, what makes the Nintendo Switch ideal for a game with that particular focus? Tom: Right from that very first build, we knew the game's strength was local co-operative multiplayer. That meant it would be most at home on a console, but every console at the time only came with a single controller in the box, so not everyone could even play local multiplayer. Adam: The Nintendo Switch comes packaged with two Joy-Cons, which you can use to play by yourself, or you can share one with a friend for multiplayer. There's a certain elegance to the detachable Joy-Con setup which matches the vision for Snipperclips – it's necessary for both Snip and Clip to be on screen to play, they're two halves of a whole really. The same could be said about the Joy-Cons! As this game can also be played in single player, can you talk about how this is implemented? Adam: You can push a button to swap between the two characters at any time. We added a few subtle features which make this experience work quite well. At SFB Games, we obviously needed to play single player a lot during development, so we're very used to it! The game is still a lot of fun by yourself. Some might say it's harder since you have to manage both characters, but I could argue that it's easier, since there's no-one around to contest your puzzle-solving ideas! There's the 'main' mode of puzzles, but we're particularly interested in the multiplayer 'Dynamic Puzzles'; can you talk about this mode and what makes these levels different? Tom: This is the mode that can be played with two-to-four players! There are four characters on the screen instead of two, so the puzzles are a little more complex - there's something for everyone to do. We're hoping there'll be lots of teamwork, but we're also expecting a few disagreements about the best way to solve puzzles! There are also some competitive multiplayer activities, what do these entail? Adam: These are modes without puzzle objectives, you're just trying to win! One of them is a game of basketball, with hoops on either end of the screen. It seems quite straightforward, but then you realise you can cut your opponent's character into shapes (or into nothing), just like the main game. Hopefully these modes don't break up any friendships. We enjoyed some of the early puzzle design in a recent demo; can you talk about a few of your favourite puzzles and concepts in the game? Adam: We tried to think of lots of puzzle mechanics which created a meaningful interaction with the character shape. One of my favourites appears later in the game, but it involves characters carrying around a sludge-like liquid. You can make cups, scoops, ramps or anything else to get the liquid to go where you need it to. It's lots of fun, and opens up new reasons to snip and clip each other! Tom: My favourite type of puzzle in the game is also one of the simplest concepts. The players are tasked with cutting each other in the right way to fill in an outline of a shape, with no part of the characters outside of the line. It lets the players focus on just the cutting and movement of the characters, so it feels like the very core of the game. Adam: My other favourite is a video-game within a video-game. 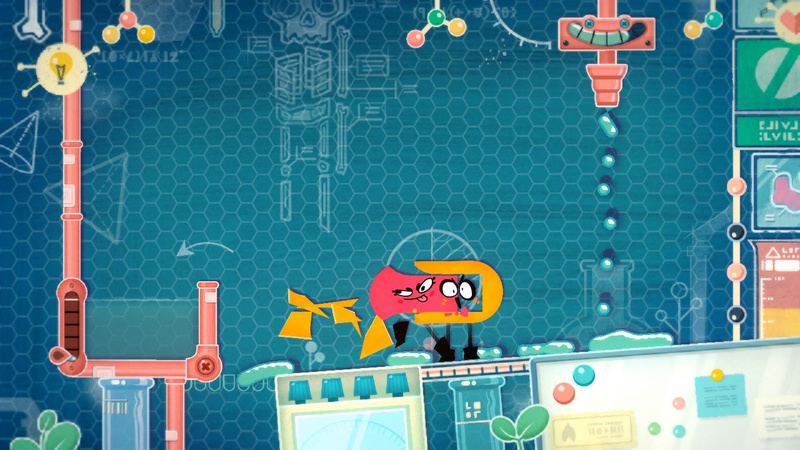 There's a puzzle where you use the characters to move a joystick, to control a tiny video game character around the screen.I feel like that kind of abstract logic is quite unique to Snipperclips. You've had lengthy and busy careers as game makers, but what does it mean to you as a team to have a game of yours published by Nintendo on the Nintendo Switch? Tom: It's the biggest step for us as game makers so far. To be working with Nintendo would alone be worth that title, but to be a Nintendo published launch title on a new Nintendo console, that's the kind of thing that only comes round once in even the longest of careers! Adam: I can't really describe it. Especially because I'm such a big fan of Nintendo - I feel like I've spent my life playing Mario, Zelda, Mario Kart and especially Smash Bros. Again, I want to say we're really grateful to Nintendo for all the support and for taking a chance with a new game and an unknown company! Ahead of the game's release, what are you most excited and nervous about in terms of feedback and response from players? Adam: I'm excited to hear about people sharing the game with friends and family – especially with people who may not usually play games. I don't feel nervous about any feedback right now, perhaps that will change in the future! Thanks for your time. Do you have a final message and pitch for our readers? Adam: If you're buying a Nintendo Switch and you'd like ways to share it with people around you, I think Snipperclips is a good way to start! Hopefully the game will strengthen friendships, and maybe help form some new ones. Tom: If you do get the game, try playing the same levels with different people, I always find that different pairs have completely different ways to solve puzzles, even if one of them has completed it already! Adam: Thanks to everyone who supports the game, and I hope you all have fun! Thanks to Tom & Adam for their time. 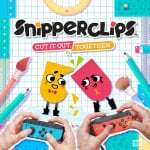 Snipperclips – Cut it out, together! will be available to download from the Nintendo Switch eShop on 3rd March for £17.99 / €19.99 / $19.99. After BOTW this is the game I'm most excited for at launch! Yep very exciting game ! Day one for me Hope to see some more games on switch in the future from the creative minds of SFB !! One of my turnoffs about the Switch release is the lack of a packed-in game. 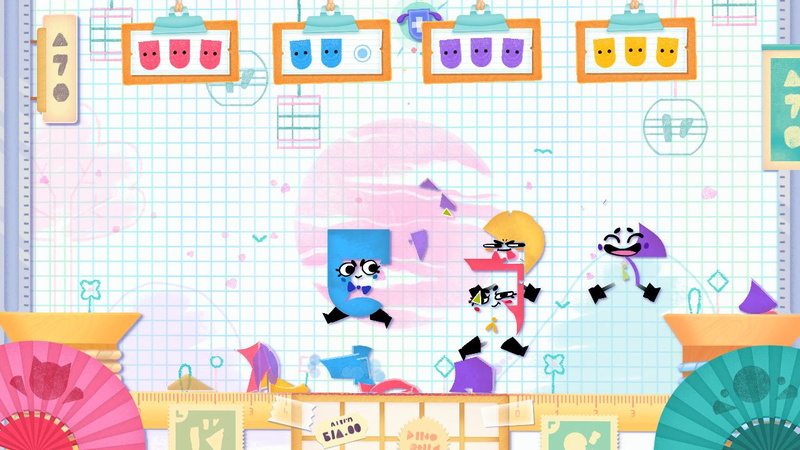 Snipperclips ( or even 1,2 Switch ) would have been a great choice to showcase some of the unique features of the console. Not to discredit this title as unworthy of a full release. It looks like a fun game. So there's no online? It looks like a terrific game otherwise. This is the one I'll be playing with my wife. She's not really a gamer but I'm sure she's going to love this. Couple of bottles of prosecco and snipperclips- that's the plan for Saturday night. @BigBadJohn That sounds like a pretty good plan to me! I'll be buying this at around 00:30 on Friday, since I'll be waiting for Amazon to deliver my games during the day. @BigBadJohn Picking this up for the exact same reason. Buying this day one for sure. does anyone know if we will be seeing the joy-con bundle with snipperclips included at launch in the uk? If not then it may be a case of buying it all seperate. @gamermole The Joy-Con Snipperclips bundle is a March 10 release. I don't think pricing has been announced yet, but I'm not really expecting a discount for the bundle. Can't find it anywhere yet. I've got a 4 hour hour train journey on Friday with my girlfriend this will be perfect for it. Super excited. @TinglesPringles Hmm... That's a good point, but I think I'll have to wait and see what ARMS is like before buying them for use with it. @BionicDodo Thanks for that! That looks like a good deal. Definitely getting Snipperclips, just not sure I really need/want the extra controllers. March 10th is too far for me haha, i need this game. Thanks for setting up this interview! ...and congrats to the Super Flash Bros for making such an awesome game that's bound for success. Looking forward to the future! Although my wife is a great platformer too. But she will love this one. @Moon Huh? These guys are the same developers as Haunt the House, Monster Bark and Help the Hero! Didn't realize I played some of their games already. Looks fun, but I'll give it a miss since it's main focus is local multiplayer. I don't have anyone nearby to play with, and this game doesn't look so fun to play on single player. The game looks so much fun and with a demo aswell can try before buy. @SLIGEACH_EIRE I was about to write a comment about how "This is a game meant to be played with communication! You can't play it online!" Then I realized the Switch has voice chat. Such a weird realization. A must buy. I hope there's a lot of gameplay hours in that game. I was on the fence about buying this since I have no one to play it with, but after FINALLY seeing a single player mode confirmed I think I'll be buying this! The that the Switch's design makes me want to get the bigger, one player games physically but buy the multiplayer games digitally so I always have some local co-op where ever I go. Any ideas of how big this is? How many levels? This game looks OFF THE CHARTS!!! Excellent launch price and the game looks so cool. It's the ultimate great example of how you do a fun co-op game on Switch. It really seems to have the core idea of fun and co-op gaming. Boy! The SuperFlashBros! Who knew? Big fan of their work since they did only flash cartoons. Wow that's amazing that they got that opportunity and how much Nintendo trusted them... a developer based in London as well!